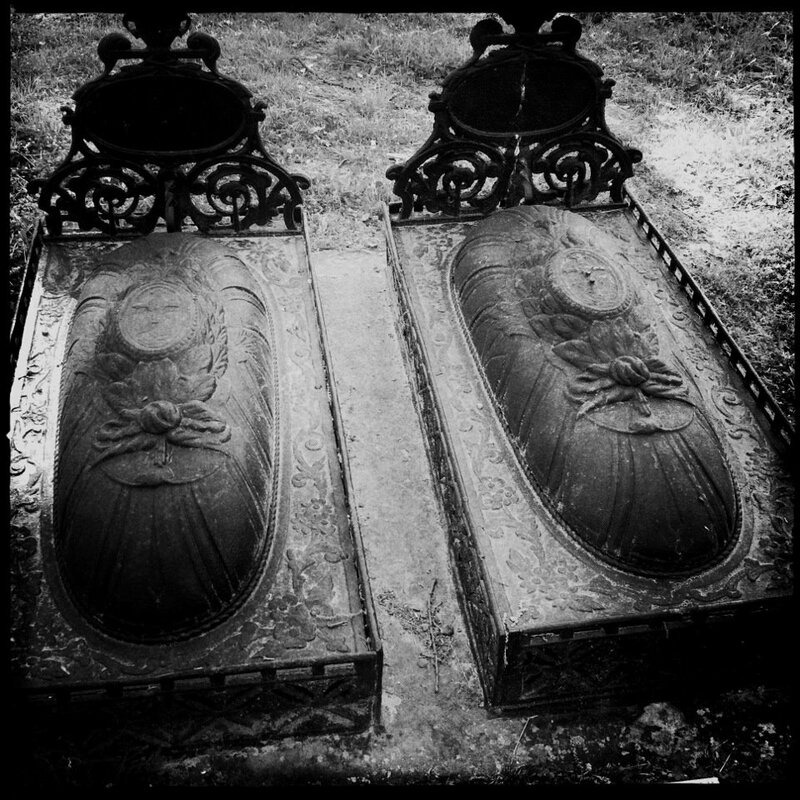 These are the cast iron crypt grave markers at the burial sites of two infants, Mary Page Dame and Channing Moore Dame in Grove Street Cemetery, Danville, Virginia. Mary Page and Channing were the children of Dr. George Washington and Mary Dame, who were married on July 22, 1835. According to this source, Channing was the couple’s third son, born on September 20, 1842 and who died on October 7, 1843. Mary Page was their second daughter, living from January 29 to December 25, 1848. That must have been particularly difficult to lose a child on Christmas Day. Dr. Dame founded Danville’s Church of the Epiphany and is known as the Father of the Episcopal church in the city. He was the Worshipful Master of Roman Eagle Lodge No. 122 of the Freemasons, the same lodge to which George Price also belonged. The Dames lived on several acres on Colquhoun Street and at age 48 his estate was valued at $14,000, which was a substantial amount for that time period. George and Mary had six children who lived past infancy, several of whom also entered the clergy. Mary Page and Channing are the only two buried in Grove Street Cemetery. 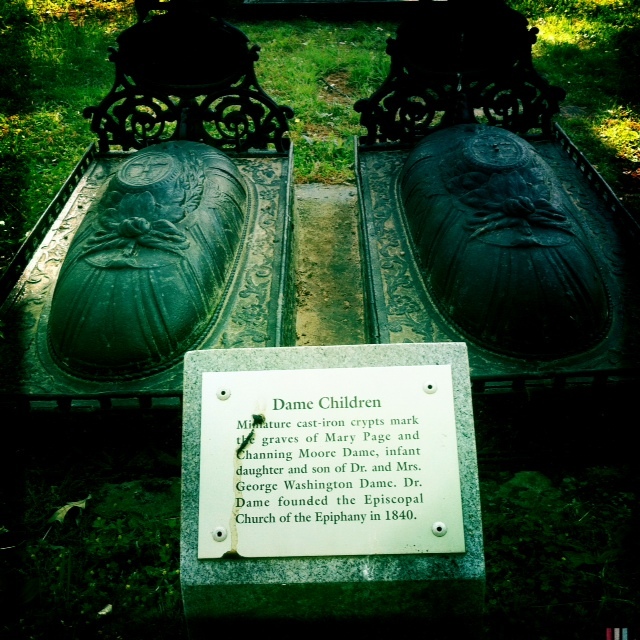 Dr. Dame and Mary are both buried in Green Hill Cemetery in Danville, Virginia, along with some of their other children. The original thread that I found on Ancestry had additional names listed as their children, but after further research I found out that some of them were actually grandchildren. What beautiful graves. I have never been lucky enough to see a cast iron bell grave in person. In some way they remind me of jelly moulds. It must have been a difficult time in which to live when the infant mortality rate was so high. As a mother myself I am enternally grateful that we live in the medical age that we do. welcome to Cemetery Sunday and thank you for linking up. Yes, it's shocking the number of children's graves you find in just about any cemetery from that time period. I can't remember seeing any other cast iron grave markers like these & I agree, they're beautiful. I have never seen graves like these before, either. Yes, Dame was her maiden name. I think Channing was also a family name somewhere along the line. I went to Green Hill today to look at the Dames' graves again but it rained before I could get to them. Next Next post: Townes-Turner Moved Graves?